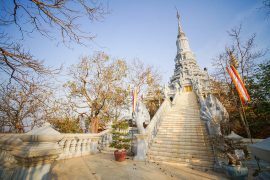 When you plan to visit a temple in Cambodia it is important to understand a little of the Buddhist religion and some underlying local superstitious beliefs. 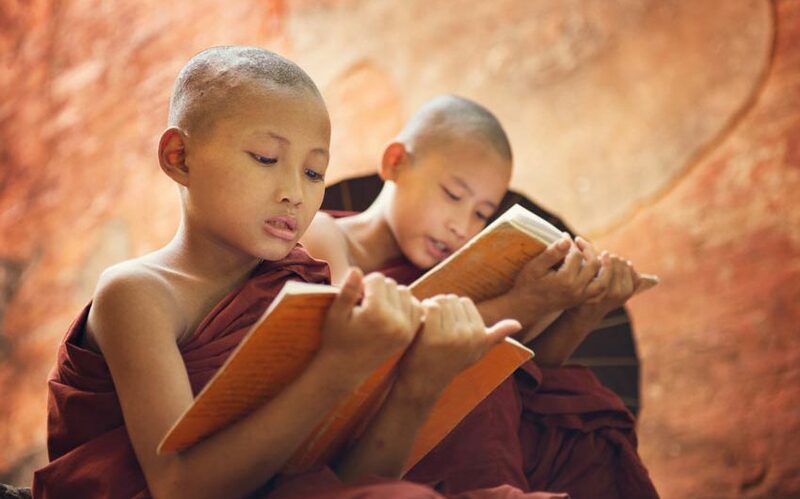 Buddhism is the official religion in Cambodia. More than 95% of the Cambodian people belong to this religion. It takes part of the national identity and the slogan of the country is “Nation King and Religion”. 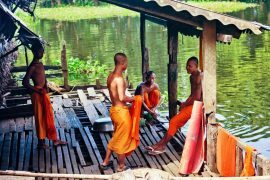 The religion of the Buddhist Khmer is the mix of Animism and Brahmanism. Their universe is populated by genius and spirits, good or bad, protector or destroyer. They also believe in the reincarnation and in the souls, presents in every person, living or not. Superstition is very current in Cambodia. All aspects of everyday life of people and in diverse events such as the construction of houses, pregnancy are governed by superstitious beliefs. Change the name of sick person to deceive the spirits. Do not pass under a clothesline considered as impure (due to the underwear). Some children wear a key around their neck to prevent the king of hell from entering their body. People who wear a Buddha around their neck have to put it in their mouth when they go to the toilet not to lose its protective effect. If you enter in a temple with a hat on the head, in your next life you will be bald. If three people have their photo taken, the person in the middle will die quickly or will have problem in their life. When a gecko begins shouting in the shape of cawing you have to make a wish (if the cry is greater or equal to 5 and odd, the wish will come true). It is not advised for two people of the same age to marry because they have the same zodiacal signs, so they can have double the happiness but also double the misfortune. In a temple you have to wear clothes which hide the shoulders and the legs. Most of the time you have to take off your shoes before you enter into a temple. You should always pass statues of Buddha by the left in a counterclockwise direction and face him by sitting down but do not point your feet in his direction. The women should never touch the monks otherwise they will lose all their merit gained. Remember in Cambodia their temples, as well as being a holy place, are also an important part of many of the local population’s daily lives. By dressing modestly, respecting the grounds as a place of worship and showing respect to the monks you will be welcomed and gain a fascinating insight into a unique way of life far removed from the influence of western society.